Jason McElwain isn’t afraid of a pinch. He reached calmly into a basket of live crabs one Friday this June, and kept his cool even when a claw clamped down hard on his finger. “You get used to it after a while,” he said, then yanked the crab off and tossed it into a plastic bin. McElwain is a deckhand at Cantler’s Riverside Inn, nestled along a cove in Annapolis, Maryland. He stood on the restaurant’s dock, sorting blue crabs still damp with saltwater from the nearby Chesapeake Bay. Up a slope from McElwain, Cantler’s patio buzzed with the afternoon rush. Young waitstaff shuttled plates of steamed crabs from the rustic indoor kitchen and bar, out to patio tables overlooking the water. The crew laughed and flirted like camp counselors in the salty, humid air. Cantler’s is a local institution, and so is blue crab. It’s the Chesapeake’s most valuable fishery by far, worth $54.5 million in 2016. Summer means crab cookouts in the backyard, and crowded crab shacks like Cantler’s. On the highway, cars sport bumper stickers shaped like blue crabs and patterned with the Maryland flag. Time will tell if the summer love can last. The Chesapeake Bay faces major climate change impacts this century. Blue crabs are one species poised to do well, said Anson “Tuck” Hines, Director of the Smithsonian Environmental Research Center in Edgewater, Maryland. But certainty is elusive, because there are so many factors that could affect crabs in the bay. 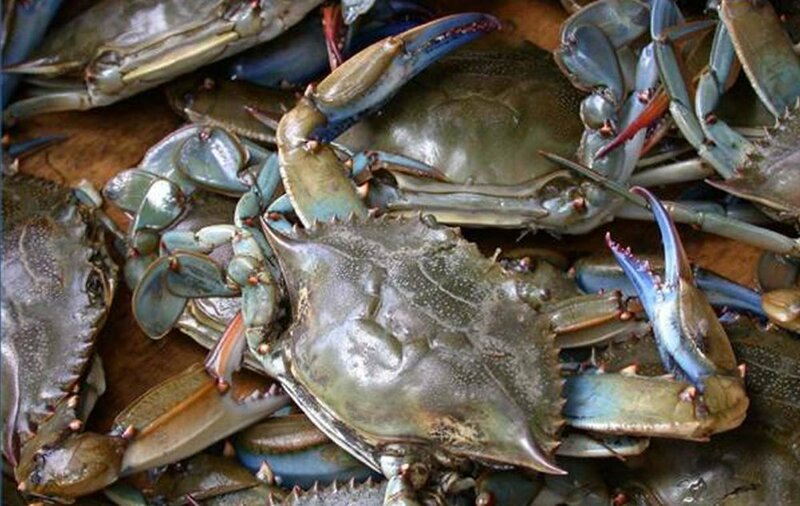 “We know the trends for some of these things,” Hines said, “but how they’re all interacting is very difficult.” If climate change does end up bad for blue crabs, the whole region will feel a pinch. Way out beyond Cantler’s dock, down in the murky water of the Chesapeake, blue crabs shuffle through the gloom, digging up clams and worms along the soft bottom. From spring to fall they grow and mate while the water is warm, then hibernate in winter. Crabbing season lasts as long as the heat, assuming the population is a healthy size. Fishermen normally haul in their gear in late autumn, when the cold turns the crustaceans too lethargic to crawl into traps. But the season could stretch longer this century, as the bay warms by roughly 4 to 11 degrees Fahrenheit. Chesapeake crabbers already supply up to a third of the blue crabs eaten in the United States. The number could rise with water temperatures. For crab shacks like Cantler’s, a longer season would mean cheaper prices and higher-quality meat, said general manager Bruce Whalen, who’s worked at the restaurant for 18 years. He orders blue crabs from the Gulf of Mexico over winter, but would prefer local all year. Year-round crabbing may be the future. Or, maybe not, said the Smithsonian’s Hines. He’s spent 40 years studying crabs, and seen his share of foregone conclusions turn out to be wrong. The Chesapeake’s blue crab fishery seemed untouchable at the start of Hines’ career. But in the early 1990s, overfishing decimated the population. Maryland and Virginia lost more than $640 million in a collapse that was ultimately declared a federal disaster. That too seemed unthinkable, until it happened. The problem with predicting the future is that climate change hits the whole bay, not just one species in isolation, Hines said. Scientists can plunk a blue crab in a tank, warm up the water and observe a happy specimen, but that misses a lot. Blue crabs don’t live alone out in the wild, and warmer water isn’t the only climate-related issue heading for the Chesapeake. Consider the Baltic clam, another denizen of the bay, and one of the blue crabs’ favorite foods. The crabs may like hot water, but the clams don’t. They’re a cold-water species at the southern end of their range, and could disappear if the bay gets much warmer. For blue crabs, the future is suddenly less assured. Crabs could lose an important food supply if the Baltic clams go. Then again, other tasty clams might move in to take the Baltic’s place, Hines said. Nobody knows how species interactions will change, and if crabs will ultimately win or lose. With their hard shells and pinching claws, blue crabs look rough-and-tumble enough to ride the tides of change. Up on Cantler’s patio, the crabs’ place in Chesapeake culture seemed just as hardy. Heaping plates of the crustaceans crowned each lunch table, where eager diners cracked into shells and tore claws from carapaces. Crabs were steamed in water hot enough to turn a blue shell bright red. It’s fitting, then, that a hotter Chesapeake looks good for blue crabs. But just like Cantler’s diners, climate change could ultimately rip them apart.